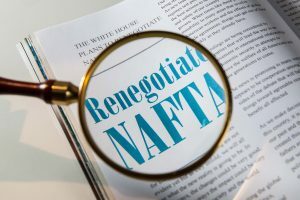 For businesses that make consistent use of the cost-savings associated with NAFTA trade, the ongoing negotiations have been a nail-biting experience. But it would be fair to say the apprehension felt by many of these businesses predated the official launch of negotiations in August. Indeed, the very idea that NAFTA could be dramatically altered or terminated has been cause for trepidation. That unease has hit a palpable level in recent weeks as the parties seem to be moving farther apart in the negotiations, which will now run into the spring of 2018. But it isn’t only the termination of NAFTA that should be cause for concern, but the increasing likelihood of a so-called Zombie NAFTA, which could keep some of the agreement’s provisions in place, but leave its final status in limbo for an extended period of time. What is a Zombie NAFTA? NAFTA is free trade agreement signed by Canada, Mexico and the United States. However, in order for the agreement’s many provisions to come into force, they were required to be passed into law by Congress via the Trade Implementation Act. Most legal experts agree the president has the authority under NAFTA Article 2205 to terminate the agreement. However, there is disagreement among them regarding the role Congress will need to play in repealing the laws associated with implementing NAFTA. A prolonged political and possibly judicial battle may ensue. The result will be uncertainty. Trade stakeholders will be dealing with a potentially lame duck, which would continue to be in force in whole or in part, but only until NAFTA’s ultimate fate is decided.